Eclipse Night London was an evening for bringing together various folks of the Eclipse ecosystem (new and old) to talk tech and share a bite & a beverage (or two). 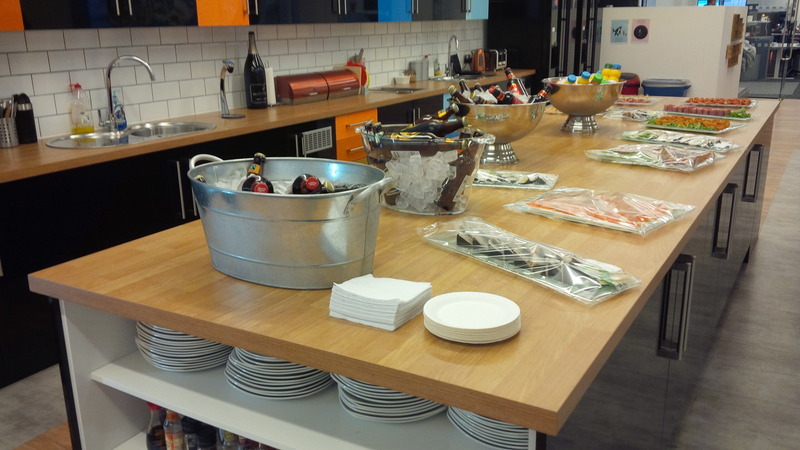 The ultramodern offices of Stackoverflow Careers in London provided a great setting for the event. The relentless rain didn’t put off the attendees, some of whom were coming from as far afield as Cambridge and Oxfordshire. First up was Ian Mayo who demoed Debrief, a maritime analysis workbench based on Eclipse RCP that is used by the royal navy. Deftly going from slick demo to slick demo it was great to learn and watch. The best bit was saved for last, watching the visualisation of the manoeuvering of two submarines onscreen. Matt Gerring talked to us about how Eclipse is used at Diamond Light Source, the synchrotron in Oxfordshire dubbed the UK’s biggest experiment. The experimental facility at Diamond handles tremendous amounts of data daily and the DAWNSci project is the workbench that helps the scientists make sense of it. Despite some tech gremlins interfering, Matt was able to talk us through it and demo some of the powerful capabilities of DAWNSci, which build on lots of existing projects in Eclipse and is part of the Eclipse Science Working Group. Genuitec were the main sponsors of the evening and my co-host Emanuel Darlea spoke about the Eclipse based projects they have to offer, including MyEclipse and Secure Delivery Centre. That led nicely into the break and time for more refreshments and chatting. Mike Milikovich, Executive Director of the Eclipse Foundation gave us an awesome overview of how Eclipse has evolved over the years, and how it continues to do so, now including Cloud and IoT platforms under its wide umbrella. 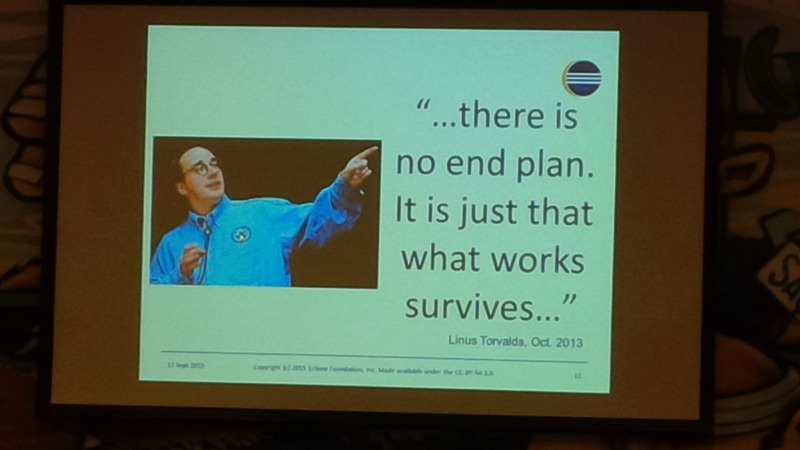 It was really interesting hearing about the ‘survival of the fittest’ approach to open source and how this means the Foundation have no idea what comes next – it is whatever technology evolves best. Also Mike talked about how the biggest challenge to Eclipse is not another IDE or technology or foundation but simply complacency, by its members and users. 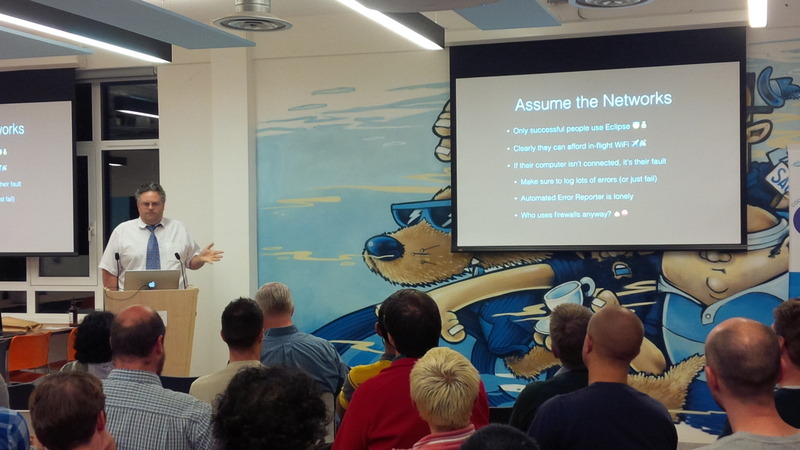 As if on cue, Alex Blewitt took the stage and inspired us all with his tongue-in-cheek presentation ‘How to write bad eclipse plugins‘. It was a terrific talk, full of energy, humour and insights into the bad bad practices we may sometimes slip into (but my plug-ins are more important than all the others..). It rounded of the evening in grand style and the presentation is worth checking out here, plus for a little taste of the talk on the night watch this. By the end the room was buzzing, conversations flowed, more drinks were had, and eventually relocated to the pub downstairs. Stackoverflow offices were great, especially thanks to Natalie and her team who made us feel very welcome and ensured we had everything we needed on the evening. Many thanks to the folks who braved the rain to make it such a great event. Also thanks to the folks behind the scenes who made it happen: Tim & Sara from Genuitec and Jelena from Eclipse Foundation. It was a great evening for learning, sharing and enjoying good company. 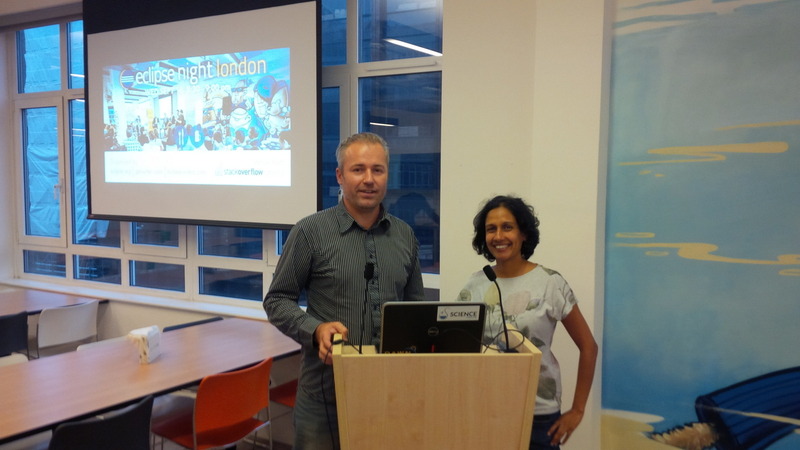 We’ll definitely be doing it again, join the Eclipse London User Group so we’ll let you know when.